Passed away whilst travelling with family in India. 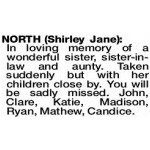 Beloved mother of Kieron, Graham, Stuart and Kim. Sister of Ann, Sylvia and John. 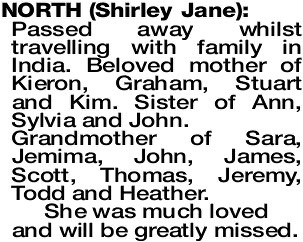 Grandmother of Sara, Jemima, John, James, Scott, Thomas, Jeremy, Todd and Heather. In loving memory of a wonderful sister, sister-in- law and aunty. Taken suddenly but with her children close by. You will be sadly missed. John, Clare, Katie, Madison, Ryan, Mathew, Candice. 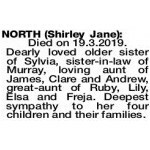 Dearly loved older sister of Sylvia, sister-in-law of Murray, loving aunt of James, Clare and Andrew, great-aunt of Ruby, Lily, Elsa and Freja. 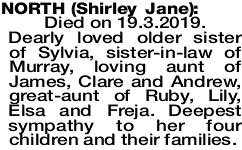 Deepest sympathy to her four children and their families.